Bought 6 for RM2 at an old shop selling malay pastry/cookies just a couple of steps ahead of the famous bus-stop in front of the public bank in Johor Bahru. That's around s'pore 15¢ each! Potato filling is reasonable. It also goes to show how ridiculous the rental component of a curry puff sold in S'pore is. Curry Puff sold by Old Chang Kee? - that's overpriced in my opinion. 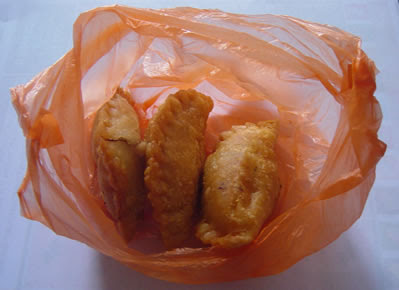 For 1 Old Chang Kee curry puff($1.30) though is bigger i can buy 8 smaller ones in JB which more than makes up for it.